Here are some solved examples on unit of mass or weight which help us to understand measurement of mass. 1. 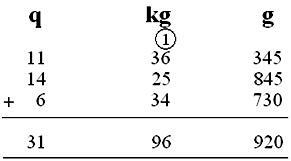 Change (1) 7165 kg into quintal and (ii) 345 quintal into kg. 3. David is 9kg heavier than Mike who weighs 35kg 675g. What is the weight of David? 4. A fruit-seller bought 46kg 500g of mangoes from one garden, 75kg 750g of mangoes from another garden and 64kg 250g of mangoes from the third garden. How much mangoes were bought by the fruit-seller? If he sold 75kg 750g mangoes, how much mangoes has he now? 5. The cost of 1 kg of tomatoes is $20.00. What is the cost of (i) 5 kg, (ii) 500 g, (iii) 100 g of tomatoes? 6. A tin of ghee weighs 15 kg 580 g. What will be the weight of (i) 9, (ii) 40 such tins? 7. The cost of 1 kg of apples is $40. What is the cost of 250 g of apples?